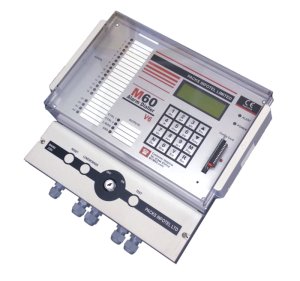 The M60 is used to help monitor and protect Power stations and Power generation plants around UK, USA, The Middle East and Asia. The most common uses include Process Protection, Power Failure, Generator Monitoring,Flare stakcs, High/Low water levels, High/Low Tempeatures, Fire Alarms and Personal Protection. 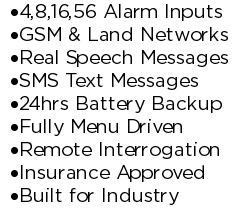 The M60 Alarm Dialler can send alarm messages as real user recordable voice messages, customisable SMS text messages and or as data to a Central Station. The M60 has multiple individual inputs (4, 8, 16, 32 or 56) each with their own voice or SMS text message. The inputs can be set as Normally Open or Normally Closed contact loops, and or you can connect up to 4 Analogue inputs. The M60 can connect to both the Mobile/Cell phone GSM networks and or the standard PSTN land line networks. The GSM network can also be used as a backup, if the connected land line fails or is cut the M60 will automatically switch across to it. The M60 is designed and built by us in the UK and is fully customisable, if you would like a particular feature or you would like the M60 to function is a special way we are happy to work with you to implement it.